In the Brussels drama school Strass, a film crew making a documentary. Award-winning “mockumentary” according to the rules of “Dogma 95”. 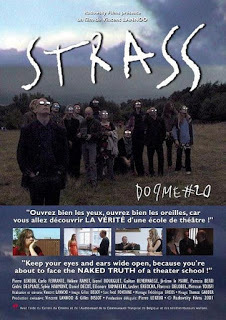 In the Brussels drama school Strass, a film crew making a documentary. The director would like to present the activities of his institute, but the film people are only interested in one thing: the famous acting teacher Pierre Radowsky and his “Open Door” method. Radowskys trademark is to provoke his students so they forget all inhibitions and mannerisms. Opposition he does not tolerate: Students are intimidated, put under psychological pressure or simply thrown out. But as in an intake interview he exceeds all limits, it then comes to rebellion. Filming the award-winning “mockumentary” on a shoestring budget and according to the rules of “Dogma 95”. Lannoo focuses entirely on his ensemble and cleverly uses the stylistic elements, which are offered by the use of the apparent documentary camera. He developed an almost documentary psychological profile of a egomaniacal drama coach and an ironic, tragicomic picture of relationships and dependencies in the microcosm of a drama school.